In the Cangiano family the passion for football is passed on from father to son, as is the case in almost all Italian families. So Salvatore Cangiano, a twenty-year career as a player between Serie D and the old Serie C (C2 Championship won with the Turris) and now coach of Colleferro (first place in the Championship of Excellence), gave it to his two sons: Riccardo, born in 1997, and Gianmarco, of four years younger. 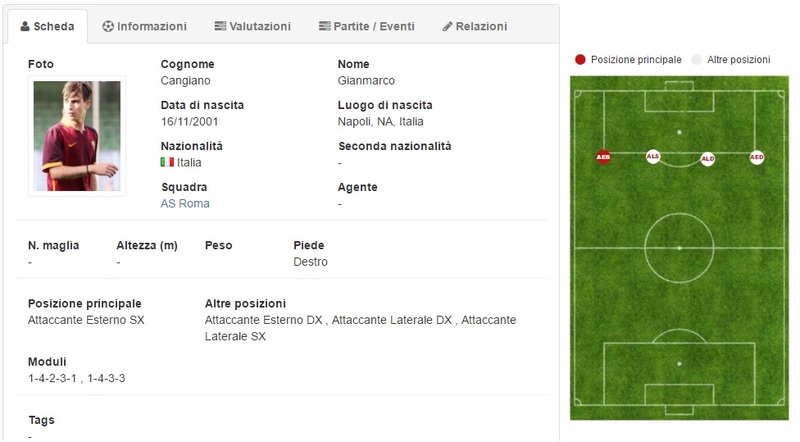 The eldest plays in Palestrina in excellence, while the child is in its seventh year in the Youth Academy of AS Roma. 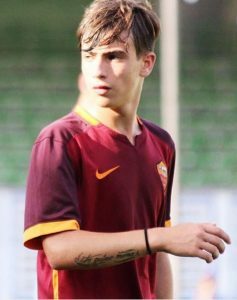 Had just 9 years Gianmarco Cangiano when he was noticed by the Giallorossi scouts: “I came to see him and observers of Palestrina proposed a trial to let him go at Trigoria-tells her father. Shortly thereafter they asked me if I was inclined to this transfer. I had moved into a region like Lazio because he was very good and had the credentials to join a professional society. As soon as they told me that they had decided to take it I was delighted. I expect that sooner or later comes an important call“. Moving firsthand for Gianmarco was the Chief observers of AS Roma Stefano Palmieri: “He was reported this blond boy and came to see him at work. He called me to ask me to go for a test. Soon after the audition he talked to the coach and said they wanted it immediately with them. ” A young talent who could not pass unnoticed because that talent had proved to have it since I was very small, as Dad Salvatore remembers: “Since he was 4 years old was really brought to the sport. At that age of 4 years I decided to take him to a football school in Sicily, where I was playing at the time, but they said they usually took their children with at least 6 years. But he just 4 years began to take its first steps in football schools. When then came the transfer to Rome, he spoke highly of him for years. I was sure that as soon as some professional team had noticed, he would run away“, he says proudly. Last season the under-15s giallorossi graduates vice champions of Italy, after the final lost 2-0 against Atalanta. Cangiano has performed well at the Final Eight, signing 3 goals of fine workmanship: “He comes from an extraordinary year. This year he went to redo well among the Under 16“. His present is and will be the future in Giallorossi. The family is more than favorable: “We are delighted that he plays for Roma. We live 40 kilometres far fromTrigoria, while he has lived for two years in boarding school and attends high school sports. The players take care of their own. Gianmarco is great at Trigoria who became a spectacular place. He also said Spalletti after his return to Rome: the Sports Center has become an extraordinary place. There are gyms, swimming pools and all the boys may need” says Mr. Cangiano. Outside natural attack, the class of ‘ 01 prefers to play on the left rather than the opposite range despite being a natural right. Cobby and good at jumping man, possesses a remarkable technical quality that allows him and a certain skill in kicking free kicks. Imagination and quickness enable him to do dribbling one of its strengths. In short, as says Cangiano SR.: “it‘s the Classic exterior attack. They say that looks like Insigne and Mertens, it’s easy to make comparisons like that. The qualities are those and the physical structure is similar “. Two terms of comparison certainly not random. David, born in their Naples, is a big fan of the Neapolitan team and one of his idols is Lorenzo Insigne. Other great passion that he has been given by his father: “He is a supporter of Napoli, although Rome now has entered the heart. Every time he takes the field gives everything for the giallorossi colors. For Gianmarco fan there is the Rome right after the Napoli“. And if one day you came onto the pitch in a Rome-Naples wearing the jacket back? Send us an e-mail to report@lfscouting.co.uk to notify us your story and your young talent!